We can all name organisations that are bad at handling crises. It would, of course, be irresponsible of me to identify them here. We might struggle, however, to name organisations that handle crises well. Those are the ones with great PR. We can’t name them because we can’t remember them. Most organisations will face a crisis sooner or later. It might be a product recall, supplier issue, internal scandal or something else. 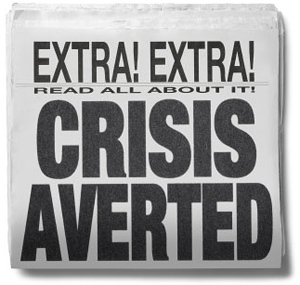 They key to successful crisis communications is to provide good, relevant, timely information. Having worked on a number of crises, I understand this better than most and can help guide you through an appropriate response. I’ve worked on floods, droughts and pollution incidents. I was handing the communications for a water company when a busy hospital lost its water supply. I was working for the British Heart Foundation when Tony Blair had his heart scare. It’s very rarely appropriate to say nothing in a crisis, the media will very quickly fill an information vacuum. But it’s important to think of audiences other than the media in a crisis. Your staff can be your greatest advocates if they know what to say, your stakeholders will need information and reassurance, your customers will expect to hear from you directly, not just read about you in the papers.